Contact Improvisation to change the world, Paper Bag (Norway), Utopian Ambassador in Exile, Robert Hall President of Ecolise Umbrella Organisation for transition movements, Anthology of a Frog Kisser, Fate of the World Jelly Wrestling (Big Oil vs Polar Bears...), Global Degrowth Activist Meeting, When to Collide into One, Voice Colour Space, Questioning the Mermaid (Spain), Climagination Visions Space, Rebel Dancer (Berlin), Ko#Tyre-Plastic-Skralde-Fashion-Cabaret, Gaming for the Revolution, DJ Grundstoff, The Intuitive Body Painting Experiment, DJ Al Lindrum, Andy Benz, Camilla Nielsen-Englyst President Ecovillages in Denmark, Alex Zampini (Italy), VJ ANnika (Germany), The revolution of Tender_NESS (Poland), Urdyb, Chris Carlsson Author of "Nowtopia" (US), Pipaluk + Cecilie Supernova, The Time Machine, The Opening of the Christiania Archive Exhibit and a Vegan Peoples Kitchen every night. Spaces like Action (constructing other worlds), Building Fantasy Animals from trash, The power of Art in transition, Nowtopian Authentic Relating, Imagining the Sustainable Future, Small scale DIY Biogas experimenting, Alternative Economics against Capitalism, Manifesting power, Speed Dating Alternatives, Defending our alternative spaces- lessons from Christiania and beyond, Changing through bodywork, Taking Dirty Better, Acting and Play for Climate Justice, Collective Living, Campaign Organising, Building rocket stoves, Degrowth and Nowtopian Dreams, Direct Action, Coping and Recovering from Activist Trauma and Political Repression, Workers Collectives- democratising workplaces, Christiania's Neighbour Warm and Medium Scale off Grid Eco-Heating Solutions. Our NOWTOPIA is alive and evolving, the story of the amazing things happening here and now, global visions, new economies, all the people who think and create sustainable futures now. The Nowtopia project is locating present desires within the history of change, including talks, actions, dance, workshops, performance, music and installations, all interconnected within an artistic borderland. 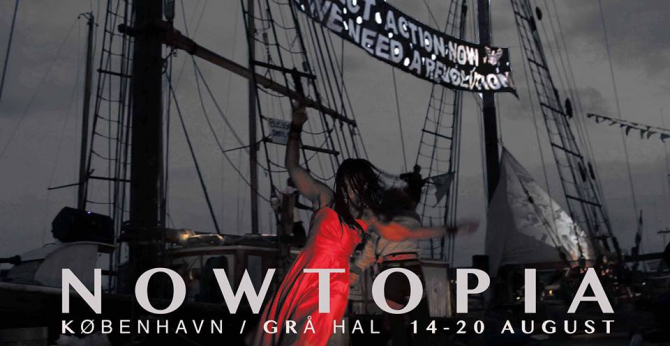 In NOWTOPIA there is fertile ground for engagement, in collaboration with the 6th International Degrowth Conference in Malmö, www.malmo.degrowth.org and The Story of Christiania project. NOWTOPIA invites communities, individuals, artists, activists, researchers and scientists to contribute to an alive forum for live art, everyday activism and change. Be involved by proposing an art experiment, event, performance, workshop or exchange, inside or outside the Grey hall in Christiania, or help out with the logistics of the event. NOWTOPIA is about meeting, moving, encountering, confronting and constructing, the worlds we want now. Participation + entry is free. You need to self-fund your contribution.